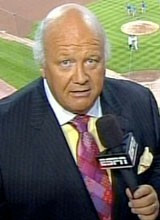 Known primarily for his broadcasts of Major League Baseball, Jon Miller was born October 11, 1951. Miller has received numerous honors for his play-by-play work, including a Cable ACE Award and several Emmy Award nominations. Among his assignments to date, he has called ten World Series on ESPN Radio. On Tuesday, August 7, 2007, at 8:51 PM PDT on KNBR radio, Miller made the historical call on Barry Bonds' 756th career home run which broke the record held by Hank Aaron for 33 years. Popular baseball players such as a Jon Miller have made the national past time what it is today. The booking agents at AthletePromotions can assist with Jon Miller appearances or speaking engagements from current and retired legends. We have years of experience in booking the boys of summer for autograph signings as well as keynote speeches. Booking a baseball speaker like Jon Miller is not a hard process. Our agents can provide availability, fees and all costs associated in bringing out a successful football star to your next corporate event. Our team will find Jon Millers agent to make this booking happen. A Jon Miller appearance will add energy to your upcoming event and reward employees, customers and clients. Most likely, baseball fans and corporations can find Jon Miller's official website, charity involvement, Twitter account, representation, publicist and management info at www.Jon Miller.com.